The followers of Zoroaster and Jesus mourn the demise and celebrate the birth anniversary of their prophets on the same day on the same street in Tehran. A mosque, a synagogue, a church and a fire temple are sitting a short distance apart along an old street in Tehran. 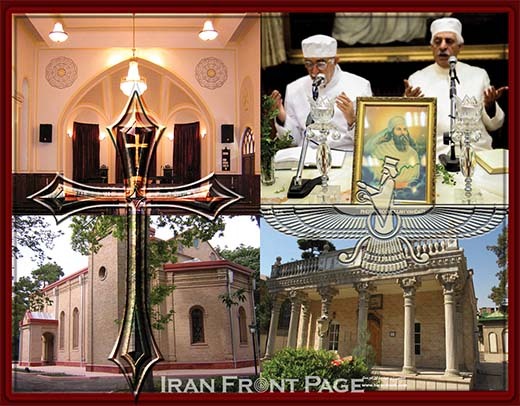 As for the neighborliness of the four houses of worship in one small area of the Iranian capital, Seyyed Mohammad Beheshti, the Head of the Research Center of Iran’s Cultural Heritage, Tourism and Handicrafts Organization (ICHTHO), which is also located on the same street, says, “Foreigners do not need to travel to different corners of the country to see the peaceful coexistence of the followers of different religions and denominations in Iran; they can simply take a short stroll along the Tir 30th Street (previously called Qavam os-Saltaneh Street) [and see for themselves how they live peacefully together]. In the ceremony, a Zoroastrian priest read out parts of the Avesta [the Zoroastrian scriptures] and the faithful started to pray en masse. Later they went to the Adrian Fire Temple in downtown Tehran for praying. Across the street from the fire temple where Zoroastrians were mourning the demise of their prophet, the Church of Mary, awash with Christmas trees and baskets of flowers, had opened its doors to Christians who were there to celebrate the birth of Jesus Christ. To enter the fire temple, women should have head covering, white scarves for instance, and men should have white hats on. As worshippers enter the temple, the Zoroastrian priest – the only person who is allowed to go into the fire place – fans the flames of fire, literally, to help his fellow Zoroastrians enjoy their praying. When praying, the Zoroastrians face fire, sunlight, moonlight, light or even a lit candle. They go to the fire temple to read the Khordeh Avesta, a Zoroastrian hymnal for laypeople, and say one of their five daily prayers there. Also as part of the ceremony, they went to the Ghasr-e Firouzeh cemetery to pay a graveside visit to the dead. They also stand in long lines to get Ash-e Nazri [votive pottage] which is cooked especially for the demise anniversary of the Zoroaster, something they view as a blessing and send it in packages to their relatives living abroad. An old Zoroastrian lady says this pottage is identical to what Muslims prepare in Muharram and Safar when they mourn the martyrdom of Imam Hussein. She adds that the Zoroastrians respect Imam Hussein for his marriage to Bibi Sharbanu [a daughter of Yazdegerd III, the last Emperor of the Sassanid dynasty in Iran] and view the third Shiite Imam as their son-in-law.